Yesterday, day two of mat leave sans husband, my lovely sister came over to visit. It gave me a chance to have a shower, play with the dog outside, and prep something for dinner. She also brought McDonalds which was highly appreciated. You might think that making dinner when you're spending an entire day looking after an infant who doesn't nap for very long at any given time would be the last thing you'd want to think about doing. But I actually enjoyed getting into the kitchen and putting a little thought into what we would eat. It was a nice return to normal life for a bit. 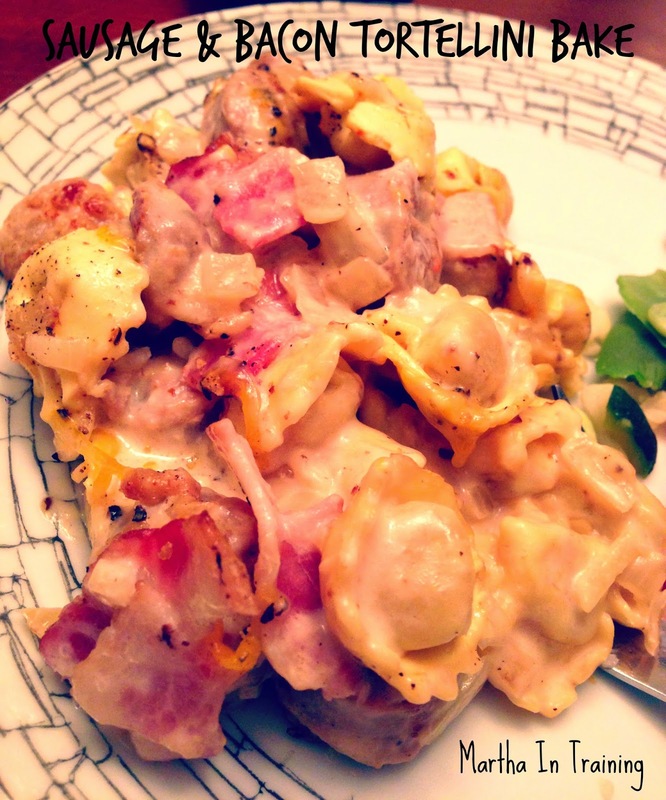 While browsing Facebook during our early morning feed, I came across a Martha recipe for a bacon tortellini bake. Since we had tortellini in the freezer, and since the dish was relatively quick and easy to prepare, I decided that making this would be my goal for the day. It was, true to its word, quick and easy. In a pan, add 3 or 4 sausages to 1/3 cup water and heat, covered, over medium-high until the sausages are cooked through, about 5-10 minutes. Remove sausages and allow to cool. Drain water from pan. In the same pan, fry 1/2 onion, diced, with 4 strips of bacon cut into strips. Add in 2 cloves of garlic, diced. Add sausage back to pan. Cook until the onions are translucent and the bacon and sausage is cooked. Add in 2 tbsp flour and stir to combine. Pour in 1/2 cup milk and stir again to combine. Add salt and pepper to taste. Add in 1 pkg tortellini and 1/4 cup parmesan cheese and allow mixture to thicken over medium heat for about4 minutes. Pour into an oven safe dish and sprinkle top with more cheese (parmesan or whatever you want). Bake at 350 for about 10 minutes, until warm and the cheese is browned. Easy enough to make with a newborn (and someone to keep said newborn entertained)!